2 or more: $189.95 ea. SPECIAL REMOVABLE THIRD HEATING ELEMENT can be added to cook 2 different dishes simultaneously, without sacrificing performance. Throw the perfect pizza party by cooking two 12" pizzas at the same time! And brunch for a crowd is easier than ever since you can toast up to 12 slices at once. 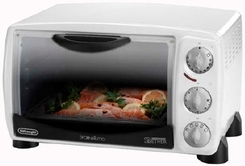 You get all the flexibility of a regular oven plus the performance of a toaster oven. TOAST COLOR SELECTOR and end-of-cycle signal with auto shut-off assure perfectly prepared toast every time. OTHER ACCESSORIES INCLUDED: 2 wire racks, 2 aluminum pizza trays, third heating element and an aluminum removable crumb tray. SLIDE-OUT CRUMB TRAY allows you to easily dispose of crumbs and other food particles. Internal Capacity: 0.8 cub. ft.